Native American elders have many of the same needs as other elder populations; however services to address these needs remain unavailable, underdeveloped or inaccessible in most Native American communities. The National Resource Center on Native American Aging is committed to identifying Native elder health and social issues. NRCNAA empowers Native people to develop community-based solutions. 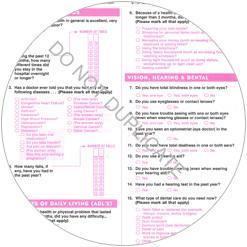 Start early on your needs assessment surveys! Mail completed surveys Start Today! 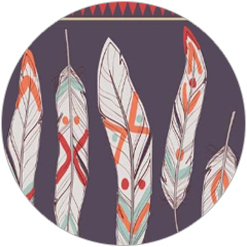 A tool designed to aid professionals, relatives, and community members who have the responsibility of caring for Native elders in their homes. 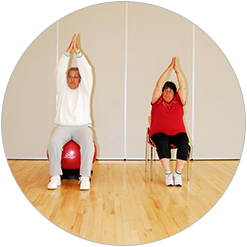 A community intervention program combining exercise, information, and social interaction to help Native elders remain active and independent for as long as possible. A survey that gathers information on health and social needs of your elders to help with tribal planning, long-term care discussions, and grant applications. 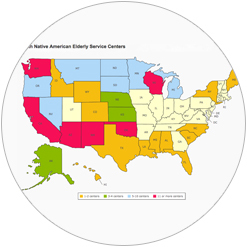 This interactive map provides a list of tribal elderly services available across the U.S. Use the interactive map to easily locate services in your state by tribe or village.